Comments The first entry from Gemstoneuniverse’s kitty in the New Year is a treat! 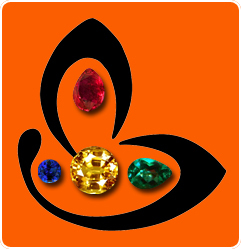 It’s a connoisseur delight.A gemstone’s beauty is accentuated many times over if it is set in a befitting design. Not to mention what magic the accent stones can do to highlight it. If you desire to own a stunner that makes heads turn and gets the WOW’s going, then the piece being featured today is the one you should be thinking about. Featured today is a gorgeous vivid reddish pink Natural ruby from Mozambique in an imposing 22 karat gold setting. The 1.67 carat ruby is surrounded by a total of 26 flawless diamonds in a design and setting customized to the patron’s liking. Whether you would like to treat yourself to a timeless piece of jewellery or gain benefit from an astro talisman or present a loved one with a gift of true lasting value, look no further. 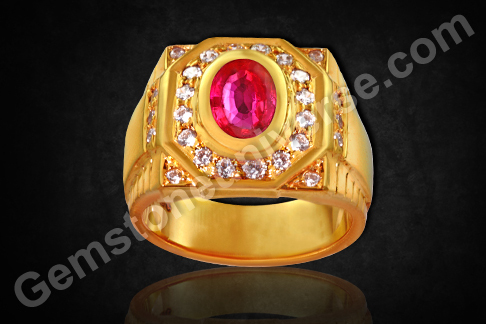 Ruby is a gem that is so full of splendor and regal overtones that it sets the wearer apart. And then of course, needless to say what a Ruby Sun talisman is capable of! The manifold benefits of planetary talismans have been experienced by patrons across the globe. Click here to read the testimonials. Meanwhile enjoy this Ruby Ring.